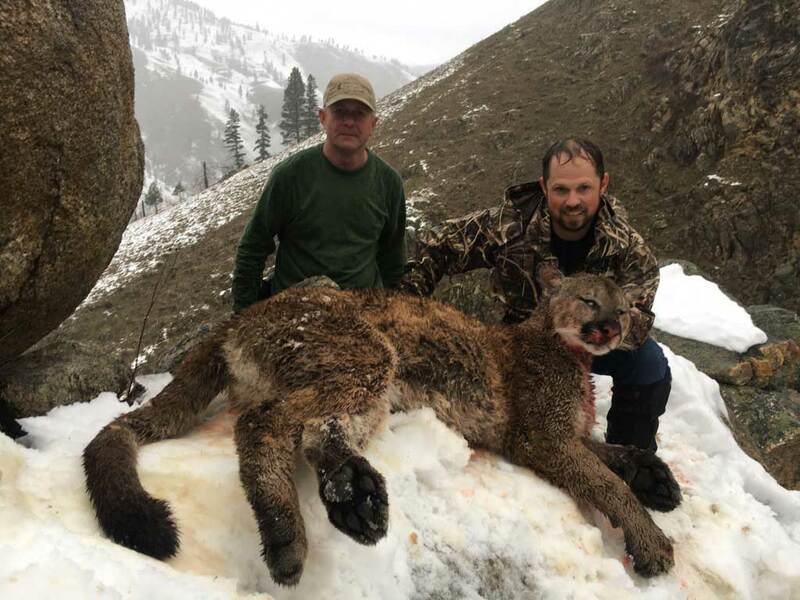 Our Idaho back country cougar hunts start in December and aren’t for the weak at heart. We will be fighting the elements in the middle of the Frank Church Wilderness above the Salmon River. We will also be running rivers that want to freeze, and climbing hills as slick as ice. Around Mackay Bar is the main wintering grounds for all elk and deer within hundreds of square miles, and where there’s elk and deer, there’s the elusive mountain lion. If you’re up to the challenge and feel as if you want to attempt to trail and stalk a mountain lion, catching him in his element without our trained hounds, then we would be happy to go that route. However, the majority of our cougar hunts are accommodated by our well-trained and determined hound dogs. It’s hard traveling but the amount of game makes it worthwhile. We are old traditional houndsmen in the fact that we only harvest mature toms. Mountain lions don’t reproduce all that quickly. Females can keep their young for up to two years and when a big tom comes in the area he may kill her young. For that reason we feel it is important to take only mature toms. If you are seeking a true trophy mountain lion, a guided Mackay Bar cougar hunt is the adventure for you! Due to the remoteness of Mackay Bar, especially in the months of December and January (when the river is frozen and you can only access Mackay Bar by snowmobile or airplane), there is very little influence by man. This adds to the adventure when you know that you and your guide are the only people within hundreds of square miles! A great opportunity with hunting in Idaho is that a non-resident general season deer or elk tag can also be used as a bear, grey wolf or a cougar tag. 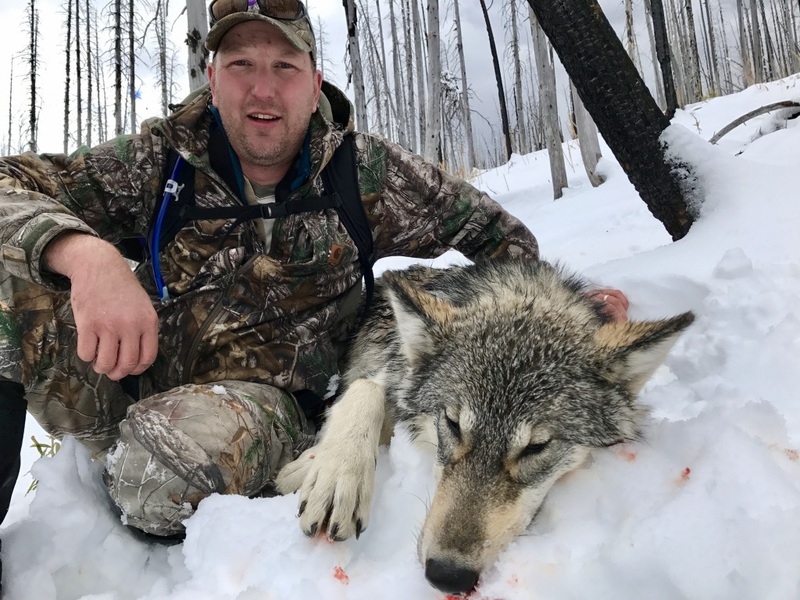 Our wolf hunts take place in the dead of winter when the elk and deer are concentrated in the canyon bottoms around Mackay Bar. This hunt is mostly spot and stock, but we also predator call. On this hunt, it is very important to have an accurate rifle because wolves are always on the move! We have a great opportunity to chase a bobcat on these hunts as well! It may be an extreme adventure, but if adventure is what you are seeking, you’ll definitely find it with Mackay Bar Outfitters & Guest Ranch. 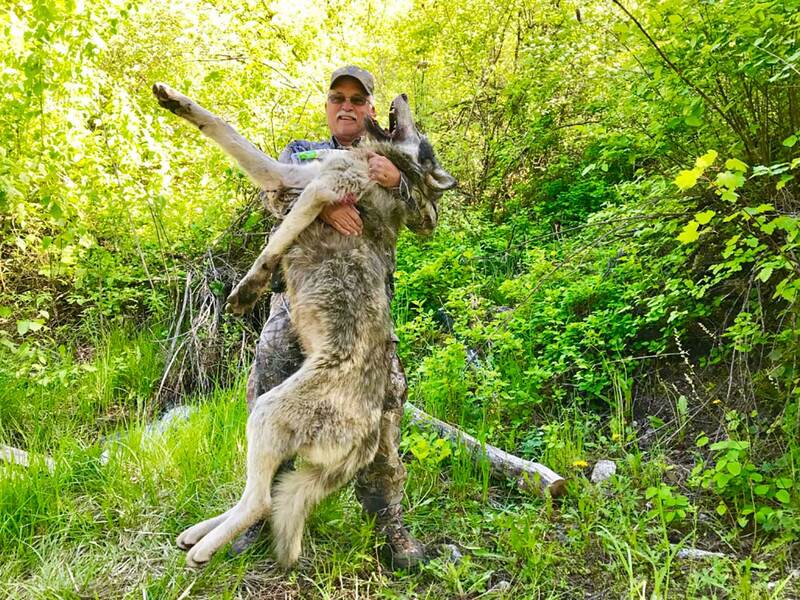 A hunt for the elusive Canadian Grey Wolf is an adventure you’ll never forget!